RMCD has 2 no till drills for landowners to rent. No tills are used to plant forage seed with minimal disturbing of the soil to avoid erosoin. New cross fence being measured. Cross fencing pastures helps keep forage and animals healthier when used properly in a rotational grazing system. 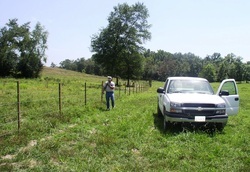 This landowner has a good start on grazing management by dividing 40 acres into 4 - 10 acre pastures with the aide of the EQIP program and NRCS partnered with RMCD. Cross fencing and water source cost share are available to landowners to help control erosion and poor plant quality. Stock tanks, gravity fed from a newly built pond that is fenced off to keep cattle out. 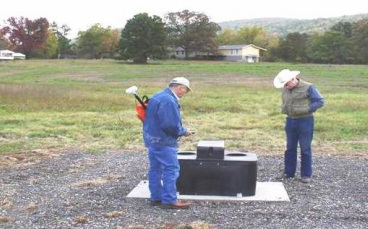 This practice keeps good water quality for livestock, fish and people. 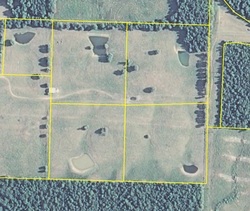 Construction on a pond to help a landowner who cross fenced have water available for livestock.